The Williams family came to Sunnyside and stayed for three generations, being a vital part of the neighborhood for most of the twentieth century. Seph Williams in front of the family home at 257 Joost Avenue in about 1905. Photo courtesy the Williams family. Digital restoration by Amy O’Hair. Sephaniah Williams, son of Welsh immigrants, was raised in Wisconsin. Seph, as he was known, came to San Francisco in about 1890 with his new bride, Mareth, who was Norwegian. They lived in the Mission District, and had three children. Prospectors getting on a ship in San Francisco, on its way to Klondike Alaska. About 1898 Seph, like so many others, was apparently gripped by the Klondike Gold Rush fever, and arranged to go to Alaska with his father and brother, first sending his wife and children back to Wisconsin to stay in the care of his mother while he went to find fortune. The journey was a costly and harrowing endeavor. Each would-be prospector had to carry a year’s worth of supplies. Jack London was there during the same time, later writing Klondike Tales about the experience. SF Examiner, 18 July 1987. View larger. Seph must have made some money from from prospecting, because shortly after returning to San Francisco, he bought the house at 257 Joost Avenue (then 219), about 1904. The Williams’s fourth child, Myrtle was born that year—the other three being Leslie, Ruby, and Seymour. About 1919. Williams Family. Top, left to right: Myrtle, Seymour, Ruby, and Leslie. Below: Seph and Mareth. Photo courtesy the Williams family. Digital restoration by Amy O’Hair. Seph seems to have snapped up property on the block as it came up for sale. He bought the house at 227 Joost Ave and all the vacant lots in between as they became available. By 1925 the family had eight lots in all on this block. The block at that time was very sparse with houses, but of course that would soon change. 1915 Sanborn map, with the WIlliams house at 257 (then 219) Joost Ave marked. It was adjacent to the Merralls house and conservatory. More about Merralls here. Seph put both houses and the empty lots up for sale during the post-Quake years, but must have changed his mind later. 27 Mar 1908, SF Call. Seph and his two sons owned the Sunnyside coalyard for many years, a family business, at 36 Monterey Blvd (building now gone). 1923. Sunnyside Coalyard truck, with Leslie Williams in the driver’s seat, Seph Williams on the right, and neighbors in the truck bed, on their way to a chilly Ocean Beach Sunday outing. Photo courtesy the Williams family. Digital restoration by Amy O’Hair. House at 227 Joost Ave on far right. 1915 Sanborn map, showing the location of the coal yard at 36 Monterey/35 Joost Ave. The lot went all the way through. Building demolished later. “Fuel and Feed” marked on the building. There was a forecourt off Monterey, which is where the following photos were taken. Besides coal, the coalyard sold hay for horses and fertilizer for gardens. It may not have paid enough for all of them, because at various times all three men seemed to have done other work, including during WW I when Seph and Seymour worked at Bethlehem Steel Shipyards. 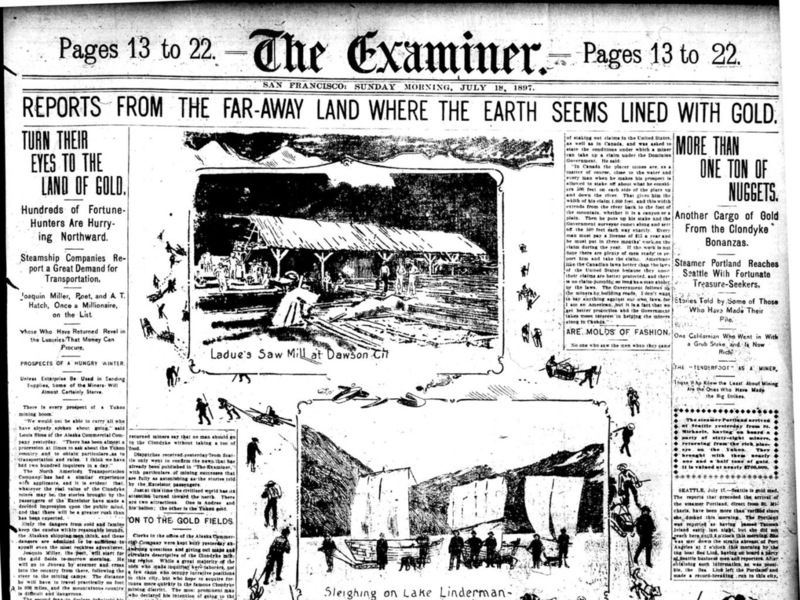 SF Examiner, 29 Apr 1928. Ad for fertilizer featuring Sunnyside Coal and Feed Yard. Newspapers.com. Still, the family business ran for about 20 years, until Leslie Williams lost title to the lot during the Depression. He was “too trusting” says his daughter Lois, and he thought, wrongly it would seem, that with so many people also struggling, he wouldn’t be foreclosed upon. Their youngest child Myrtle, like so many working class children then, left school after 8th grade—but she trained to be a comptometer operator, and was working in an office before her 16th birthday. Comptometers were early calculators that many women were trained for and operated in offices. She seems to have been proud of her working life, which looks like it was a pretty glamorous career, from the magazine cover above. After she was married in 1925 to Glynn Pence, she listed herself separately in the Directory, so that her own occupation would be be shown, something that doesn’t happen when husband and wife are listed jointly. She continued to work for many years after marriage, apparently not quite ready yet to retreat into the private realm of being a housewife. Later they had a son also named Glynn. Of the four children, it was Myrtle and younger son Seymour who remained on this block of Joost Avenue for their whole lives. Myrtle and her family lived 257 Joost Ave. When Myrtle’s husband died, she married again. After her second husband’s death, she remained in the house until the day she died, in the 1980s. Several houses down the street, Seymour stayed single and cared for his parents until they passed away. Then he married a woman named Thelma who already had two daughters. Together they had three more children, and went on living at 227 Joost Ave for many years to come. Seymour worked as a driver for a lumber firm in 1940s. Thelma lived there after Seymour passed away in 1962. Later she moved to the house next door in the 1970s, and living there until nearly the end of her life. The plaque at the Little League baseball diamond at Glen Canyon Park, dedicated in 1991 to Thelma Williams. Photo: Amy O’Hair. 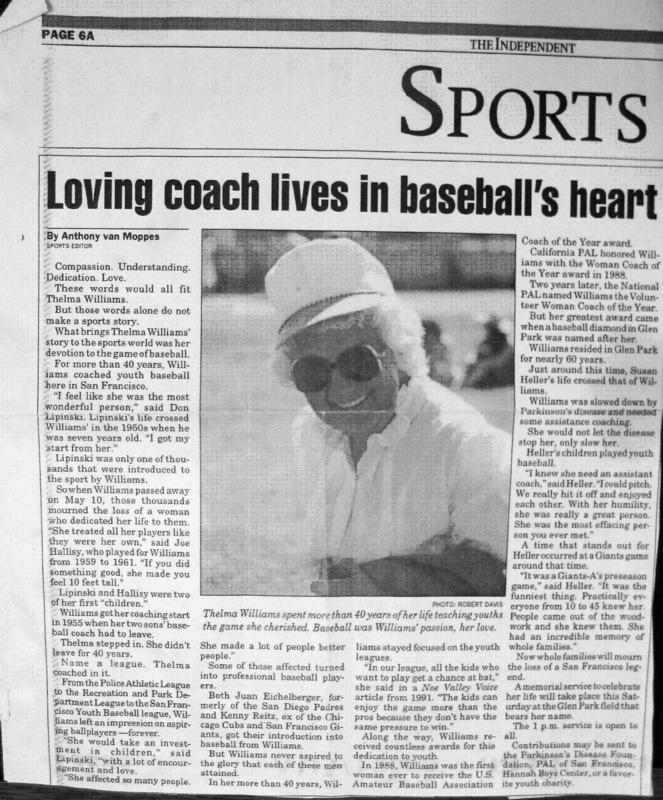 Thelma Williams is perhaps the most famous member of the Williams family in Sunnyside/Glen Park history, having dedicated herself to coaching kids in Little League baseball for 40 years, from the time her sons were playing in the 1950s, until she died in 2000. She was recognized by the Police Activities League and there is a plaque in Glen Canyon next to the Little League baseball diamond named after her. 1991, SF Independent. View larger. Read this detailed account of Thelma Williams life on Glen Park Association’s blog. For almost the whole of the twentieth century, there were members of the Williams family in Sunnyside, living ordinary lives that turn out to be extraordinary in their own way: a gold prospector off for wild Alaska; a family business for the neighborhood; a young woman determined to get a good job and keep it after marriage; and a mother dedicated to baseball for kids not her own. In all, a family that stayed close over many decades and were a vital part of their community. 2018 © Amy O’Hair, text and images. Pingback: Do you know the name of Glen Park’s baseball diamond? Read this and you’ll never forget it.